Being Boss is a podcast for creative entrepreneurs, freelancers, and side-hustlers, whether you're wanting to quit your day job or have been your own boss for a while now. 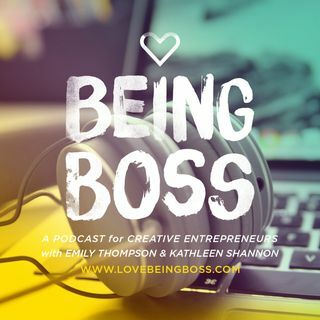 Authors and "business besties" Emily Thompson and Kathleen Shannon dig into the mindset, habits, routines, boundaries, branding, marketing tactics, ... See More business strategies, systems, and processes that help you make money doing what you love. Join us as we interview bosses such as Brené Brown, Brooke Castillo, Marie Forleo, Ramit Sethi, Danielle LaPorte, Chalene Johnson, Mike Michalowicz of Profit First, Melissa Hartwig of Whole30, and more! Subscribe, rate, and review wherever you listen to good podcasts.